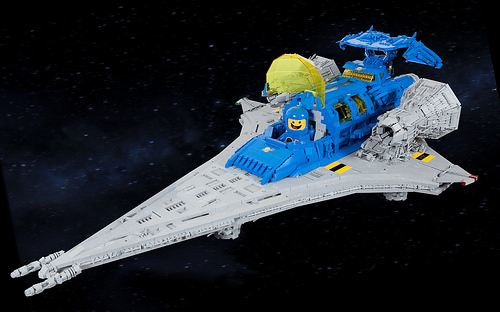 That’s right, those are GIANT mini-figs and one HUGE spaceship! Well actually they are LEGO spaceman LED flashlights and this crazy scene is brought to you by our very own Simon Liu, who was given the flashlights as gifts and figured this was the most logical thing to do with them. 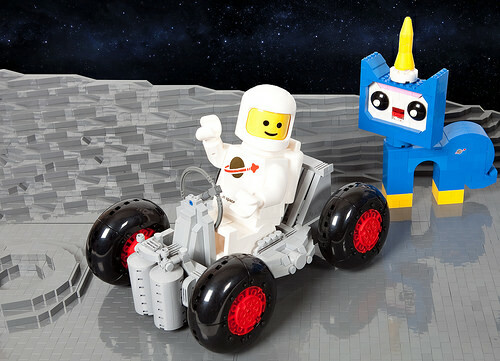 Of course, the blue spaceman has been magically transformed into Benny from The LEGO Movie. And with the addition of Simon’s giant Unikitty, the scene now makes total sense… It’s obviously from the sequel, and this is our hero’s plan to deal with the giant monsters from Planet Duplo! I was fortunate enough to drool all over marvel this at Brickworld Chicago a few weeks back, where Simon’s creation won the award for BEST SPACESHIP. Congratulations, Brother Si-MOCs! All that bribery and blackmail clearly paid off. never stop using that joke! I love these models. The bigger scales allowed Simon to build with such details, that’s awesome. Just for the sake of picking nits, the blue Lego astronaut (Benny) debuted in 1984, which was several years after the ’70s. Thanks for the post Iain!